The PADI Open Water Diver Class is the first step to your next adventure. As a PADI Open Water Diver, you can explore the local lakes or expand your horizons and visit tropical oceans. Your PADI Open Water Certification is a life time certification and opens up a whole new world. Start your diving adventure by choosing the training materials that fit your learning style. The most popular choice is the PADI Open Water Diver Class Digital formats- the interactive course materials are easy to use and can be completed on either a PC, MAC, tablet or iPad. Work at your own pace in the comfort of your home. Now, the fun begins! The pool dives are where you put the things you learned in your digital class into action. With your PADI Instructor, you will practice the skills needed to become a PADI Open Water Certified Diver. From that first breath, you will be amazed and wonder what took you so long to sign up. Weekends to fast for you? Need a little more time? Have to work on weekends? Let us work a custom schedule out for you. Contact us to work out the details. After completing your “class and pool” sessions it is time to head to a lake or ocean to complete your open water dives. The Open Waters dives are a series of four dives done over two days. During these dives, you demonstrate to your instructor you mastery of the skills that you learned in the pool and classroom. 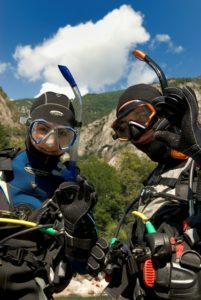 These dives are offered year round- during the summer at local dive sites or during the winter at a warm springs in Utah. Prefer to complete your Open Water dives on a trip? No problem! PADI instructors and dive shops are found around the world. We can help you connect with a PADI Dive Center at your destination. We can also assist you in planning and booking your trip. Classes start at $375 and includes everything you need to start your diving adventure. Why wait? Sign up for PADI Open Water Diver Touch today.